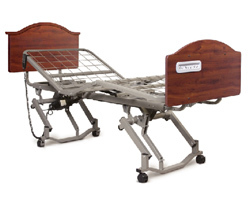 The Matrix Hi-Lo Bed comes with many standard features, including sleep deck height adjustment from 8.75 " to 25.25" and a single motor for Hi-Lo function that ensures the bed is always level. It has a dynamic operating capacity of 375 lb and meets the highest UL safety standards for medical beds, UL60601 and EN60601. CAN/CSA C22.2 No. 601-1-M90 approved. It has strong tubular panel mounting and built-in stabilizer feet that ensure the bed will automatically lock in the lowest position. The bed features individual locking casters. The bed system is patent pending. Maximum head elevation of 70 degrees. Sleep surface constructed of strong steel wire grid: no plastic or springs are used. Rigid construction utilizing heavy tubular steel to maximize strength and stability of the sleep surface in all positions. All weldments and components are electrostatically powder-coated or plated. Full-Electric operation with three ultra whisper quiet, rapid-moving DC motors.